Which of These Sci-Fi Ships Was Once Slated for a Full-Size Replica in Las Vegas? 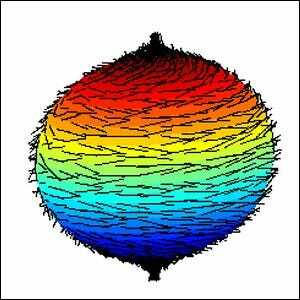 Although it sounds like the start of a bad science joke, the Hairy Ball Theorem helps inform the design of antenna transmission models. Engineers attempting to build an isotropic antenna with perfectly spherical transmission run smack into the Hairy Ball Theorem of Algebraic Topology, which states that there is no non-vanishing continuous tangent vector field on even-dimensional n-spheres. The theorem was first proven in 1912 by Dutch mathematician and philosopher Luitzen Egbertus Jan Brouwer. In layman’s terms, the transmission waves are the hairs on the ball and any attempt to smooth all the hairs at once to create a perfect sphere results in a tuft of the “hair” sticking up somewhere—thus engineers could never create an antenna with a perfectly uniform transmission sphere. They were stuck, electromagnetically speaking, playing an unwinnable game of whack-a-mole.